With "rust on the ponderous iron-work" and weathered sinners behind it, the prison door was hardly a place spoken fondly of by the Puritans of the Massachusetts Colony. Seeking to perpetuate the description of a stereotypical prison door, the door halting the exit and entrance of people from the prison was a sign to those behind it that their guilt had been confirmed and judgment distributed. Hester had no doubt of this as she sat behind the door and was forced to brand her guilt on her bosom in the form of a scarlet letter. While the prison door is a symbol of entrapment within ones own guilt, the scarlet letter serves this purpose as well. Although Hester is eventually freed from prison, the scarlet letter forces her to remain captured by the guilt of what she has done and to be held responsible for her actions. Both symbols act to restrict Hester from her freedom, physically in the case of the door and mentally in the form of the letter. In both symbols there is a small detail of beauty. 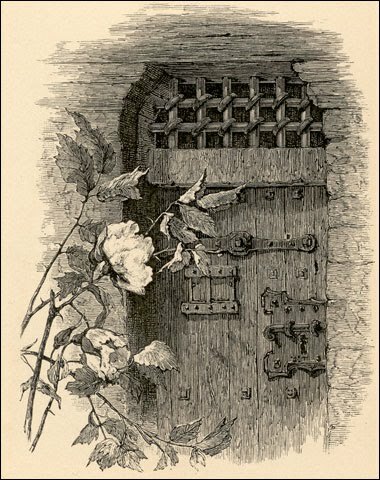 On the side of the prison door, a rose bush grows to offer "fragrance and fragile beauty to the prisoner... in token that the deep heart of Nature could pity and be kind to him." The same strange, out of place beauty is found in the golden embroidery found surrounding Hester's "A". This gold thread that surrounds this representation of sin and judgment possesses the same symbolism as the rose bush, that there is forgiveness and love available to Hester, if only she can break free of the guilt holding her hostage. Until then she is trapped in the isolation that both the prison door and scarlet letter symbolize. 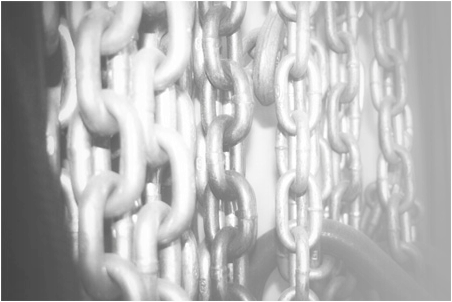 These chains represent Hester's entrapment by her guilt.